From the national territory of 5,7 million of hectares, agricultural land in Croatia covered 3,2 million hectares from which 1,5 million of hectares are arable land. In last five years vegetable are grown on about 3,5% of arable land area, what is about 55.000 hectares. The most important vegetables grown on open field in Croatia are cabbages, dry bean, onion, tomato, pepper and cucumber which are grown at more than 70% of total vegetable growing area. Total area of vegetable production under protected condition in Croatia is about 1.500 hectares, what are about 2,8% of the total vegetable production area. To compare with four years ago period total acreage of production under protected condition in Croatia increased 37% what is almost 10% yearly. 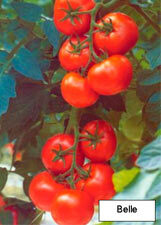 In Croatia there are just 40 hectares of glasshouses, in which vegetable are grown on 15 hectares. Plastic houses are on about 220 hectares, walk-in tunnels 250 hectares and low tunnels 260 hectares. Plastic mulches are used on about 470 hectares and direct cover on about 250 hectares. Soilles vegetable production there is just on 4 hectares area mostly use growing media a rock wool and sometimes wooden sawdust. In last four years there are no significant increasing of acreages by glasshouses. Just 4 new hectares are in function of vegetable production to compare with period four years ago. 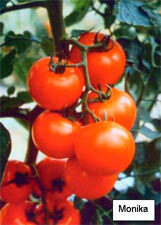 From total acreage by glasshouse in 15 hectares are grown vegetables and in rest flower and vegetable seedlings. Acreages by plastic houses in last four years increased almost 50%. 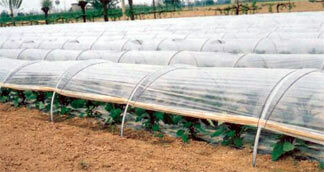 Plastic houses are used mostly for commercial vegetable production and one part for vegetable seedlings production. The most important vegetable grown in plastic houses in Croatia as a main crop is tomato with occupation of approximately 40%. 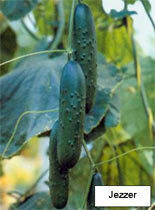 Cucumber are grown on 25%, pepper on 20%, and rest of vegetable on 15%. As a second crop during the late autumn and wintertime there are growing lettuces on almost 80% of plastic houses. There are a wide range of plastic hoses construction, from home made wooden construction with one layer of conventional PE film to the modern construction of galvanised steel with lateral and front sides made from polycarbonate and with cover of double layer of EVA films. Just 10% of plastic hoses are heated mostly by light fuel and used for transplant production. 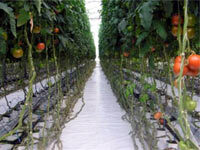 For irrigation in tomato, pepper and cucumber plastic houses production mostly in use are drip irrigation systems and in lettuces and transplant production sprinkler systems. Acreages of walk in tunnels in last four years are increased about 10%. The same vegetables as in plastic houses are grown in walk in tunnels as seedlings too. In resent time seedling in walk in tunnels are grown as flotation culture too. Construction of walk-in tunnels are made from plastic or steel and covered mostly with conventional PE films. Sometimes as a soil cover in use are mulches mostly as white film. Low tunnels acreages in last four years are increased about 25%. Traditionally low tunnels use for seedlings production are changed and now much more them is in use for watermelon and another vegetable production. 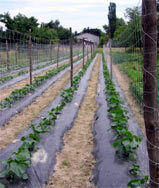 In watermelon production in low tunnels mostly as mulch in use is black film. Mulch using in vegetable production in last four years are increased about 30%. Mulch is in use mostly in pickling cucumber, watermelon, tomato and pepper production as a black film, and sometimes in lettuce production during the summer in coastal area as a white film. Other color mulch just is in experimental phase of use. Acreages by direct covering in last four years are increased four times. Direct cover is use mostly in early potato and pickling cucumber production as in late lettuce production. There are two main areas for vegetable production as protected crops. Adriatic area with plenty of sunny days and favorable temperatures during the winter period as a continental area. In tomato production in greenhouses mostly in use are hybrids Jenna and Petula (Rijk Zwaan), Belle and Mondial (Enza Zaden), Arleta (Royal Sluis), Monica and Sinatra (Sandoz Seeds), Don Jose (Tezier) and Alambra (Nickerson Zwaan). Average yield is 12 - 14 kg per m2. Total of greenhouse tomato production are consumed in Croatia together with about 15.000 metric tons of yearly import mostly from Italy, Holland, Spain and Turkey. Croatian market prefers mostly blocky type pepper of white-yellow color. In greenhouses in use are hybrids Istra (Harris Moran), Blondy (Sandoz Seeds), Madonna (Tezier), Menta (Rijk Zwann) and Bianka (Enza Zaden). Average yield is about 10 kg per m2. Pepper production from greenhouses is mostly consumed in Croatia together with 3.500 metric tons of yearly import mostly from FYR Macedonia, Hungary and Bulgaria. In cucumber production in use are mostly hybrids Astrea (Sandoz Seeds), Darina (Royal Sluis), Solvedre (Bruisma) Pontia and Jazzer (Enza Zaden). 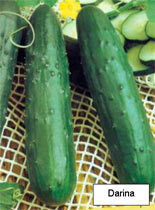 Average yield of cucumber produced in unheated greenhouses is 12 - 14 kg per m2. Production is mostly for domestic market together with 2.000 metric tons of yearly import mostly from Italy, Spain and Hungary. In lettuce production in use are mostly varieties Sensai and Angie (Rijk Zwan), Masaida (Sandoz Seeds), Soprane (Tezier), and Fulmaria and Mariola (Royal Sluis). Average yield obtained in greenhouse production is 3,5 - 4,5 kg per m2. As another vegetables from greenhouses whole production of lettuces are for domestic market as 850 metric tons of yearly import. In soilles vegetable production in Croatia on the growing media rock wool there are production of tomato, cucumber and pepper. Global situation in greenhouses vegetable production in Croatia in compare with ecological conditions we have, especially at coast area is relatively bad. The most important problem is unorganized market. Through the transition cooperative system was totally destroyed and now there are just a few organizations, which organize vegetable production and buy it from farmers. Second problem is a very high import of all kind of vegetables, about 10% of total production, but as marketable vegetables it is more than 30%. In first nine months of 2004 Croatia imported fresh and processed vegetable in value of 70 million $. There is no special government support for greenhouse vegetable production and existing credit lines are not attractive for farmers. Just few counties locally support the farmers for greenhouse vegetable production. Level of farmer knowledge as a technical equipped their farm is relatively low for competition with farmers from agricultural high-developed countries. Some international projects active in Croatia now, better organization of the market as a better domestic government support can improve this kind of vegetable production in Croatia not only for domestic needs than for export too. 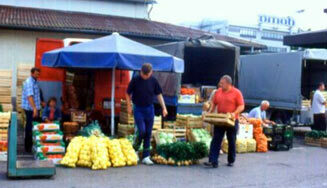 For improving the knowledge, getting recent information about prices of vegetable on the market as for better communications with potential buyers of vegetable farmers in Croatia can use new web sites www.povrce.com active from last year.